Pastor Polly Holland "We Love People"
Polly has been involved in ministry since she was able to speak. She was raised in a musical family where she would sing songs that would minster to people through worship. Polly grew up around Pollock, LA and graduated from Grant High School in 1994. In 2000 she graduated from Northwestern State University in Natchitoches, LA with a degree in Psychology. 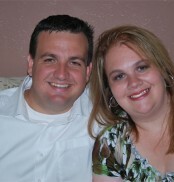 She is currently a 2nd Grade teacher at Evangel Christian Academy and loves to minister to children in the classroom. She has a passion to see to see people experience true worship in a relationship with God. Polly’s family: Polly is married to Michael & has two beautiful girls, Faith & Ella. Ministry Role: Pastor to Ladies in the church and worship team member. Dream vacation: Travel to London! What’s your regular order at Starbucks: Caramel Frapachino with Whipped Cream! Favorite movie: My Big Fat Greek Wedding & While you were Sleeping. Things that fascinate me: Animals, especially cats. One thing that most people don’t know about me: I once broke a boys nose in Jr. High. Music that moves me: Worship Music. Peeves: Michael’s dirty socks on the floor! Life-changing moment: The Day I married my best friend & the birth of my children! Fears: Heights & Roller Coasters. In my spare time I… hmmm Spare time? Listen to music , fishing and horseback riding. What makes you laugh? My Husband. What is weird about you? My obsession with cats. The most exotic place you’ve even been to: Orlando, Florida. The most adventurous thing you’ve ever done: Took a ride in a real NASCAR at Lowes Motor Speedway. Least favorite thing to do: Clean House!